Main grape varieties: 55 are grown. Most wineries focus on Syrah, Chardonnay, Pinot Noir and Grenache. Thankfully, Jonata ignored his advice (even naming a wine Defiance in honour of the snub) and proceeded to cultivate world-class wines, garnering high praise for its Bordeaux varietals, Syrah and Sangiovese wines. Indeed, defiance is the watchword in Santa Barbara County. This still-emerging wine frontier resists stereotyping and simplification, due in large part to the region’s astonishing density of microclimates and intrepid winemakers who value individuality over rules. Just two and a half hours north of Los Angeles, the area’s small towns are vestiges of the old stagecoach line from Santa Barbara to San Luis Obispo. You’ll find a few historic remnants of that time in some of the restored Old West frontier architecture, but it remains an impossible region to characterise. Here, steep oceanside cliffs yield to softer rolling hills dotted with olive trees, wild lavender and bent, gnarled oaks. Cowboys and pick-up trucks mingle with BMWs and sedans, just as ranchers and winemakers mingle with tourists and farmers. As a transverse valley – one of the world’s few – a 17 ̊C temperature variation exists from one end of the county to the other. A 21 ̊C day in Santa Rita Hills (where Burgundian varieties thrive) is a 38 ̊C day in Happy Canyon (great for Rhône varieties). The one constant is the Pacific Ocean’s cooling influence, with breezes funnelled through the valley, soothing the grapes into gentle ripening, and nurturing acidity. The result is a beautiful marriage of fruit and freshness, variety and complexity. In a single day of wine touring you might come across a juicy cherry-berry Malbec, an Albariño perfumed with peaches and flowers and a dense, smoky Syrah – and you’ll only have driven 24km. 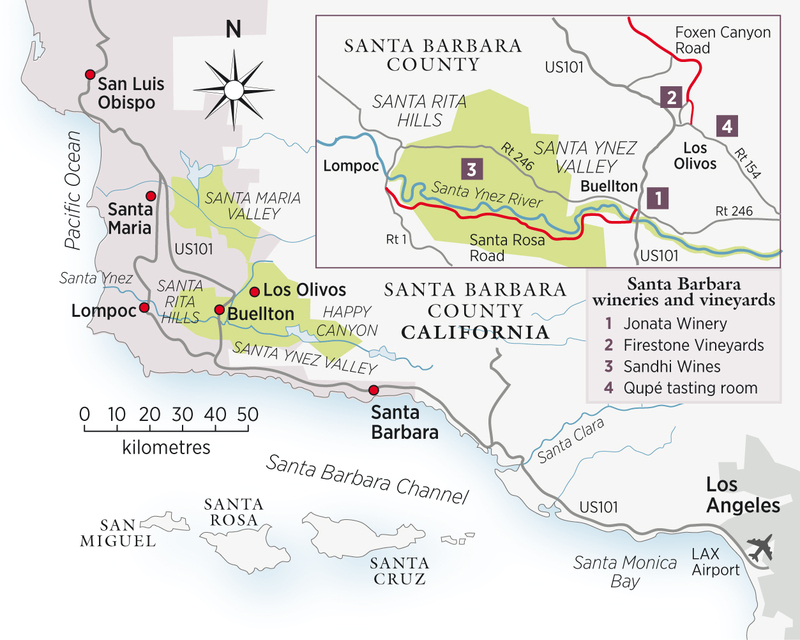 Given this extraordinary confluence of geography, sun and experimentation, Santa Barbara County is a wine adventurer’s paradise. The region is best considered as a wheel, with the town of Buellton at the centre and tasting trails as spokes heading in different directions. The towns are small and easily navigable, and distances are negligible – if you’re ambitious enough you can manage two or even three spokes of the tasting wheel in a single day. For a taste of cool-climate, Burgundian-style wines, make tracks for the town of Lompoc in the Santa Rita Hills, about 15 minutes from Buellton. Much like Burgundy, you’ll find mostly Pinot Noir and Chardonnay here. Gavin Chanin, the winemaker for Lutum, notes that Santa Barbara ‘has an ideal climate for Pinot Noir. Burgundy gets maybe 100 days from flower to harvest; we enjoy 130 days. Our wines ripen on sunshine, not heat’. The Santa Rita Hills Pinot Noirs drink like a prima ballerina with a no-nonsense left hook, delivering elegance, balance and beauty with spices, ripe fruit and serious concentration. Take in the vineyard scenery and drive down Santa Rosa Road or park the car and sample wines in the Lompoc Wine Ghetto, aptly named for the industrial-park ambience of the tasting rooms. What it lacks in architectural charms it makes up for in delicious wines. Two stops that also merit a visit are Piedrasassi, with gorgeous, small-batch Chardonnay and Syrah from the winemaker Sashi Moorman, and Palmina – beautifully expressed Italian varieties: Arneis, Dolcetto and Barbera from the winemaker Steve Clifton. Be sure to pop into Sashi Moorman’s bakery, New Vineland Bread, just behind his tasting room, for fresh loaves for your sandwiches later. Serious Grenache and Syrah can be found on the northern spoke, up Foxen Canyon Road, about 10 minutes from Buellton. 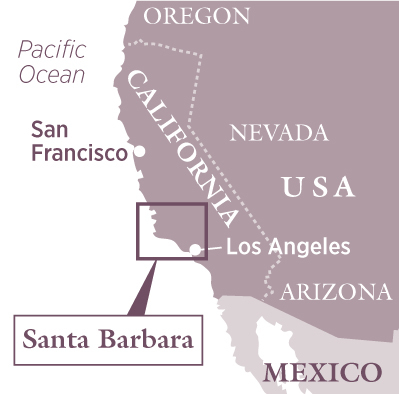 Here you’ll bump into a bit more of the Wild West spirit of Santa Barbara County, and much higher temperatures. Vintners, such as Koehler, offer aromatic Rieslings along with the likes of a supple, rich Sangiovese/Cabernet Sauvignon blend (Magia Nera). It’s also a peaceful picnic spot. At Zaca Mesa go for the samplings of Syrahs from some of the region’s oldest vines – and enjoy the life-size chessboard and short winery hiking trail while you’re there. The town of Los Olivos, about five minutes’ drive from Buellton, is a mini-spoke on the wheel, but packed with tasting options. In addition to wine, you’ll find olive oil producers and expert restaurateurs. The perfect place for an afternoon stroll, Los Olivos has a concentration of small winery tasting rooms, such as The Los Olivos Tasting Room, where nine wines are poured and 90 are for sale. Santa Barbara County is no small region to explore, but that’s part of the adventure. Winemakers are experimenting, and producing some knockout wines. But when darkness falls, all is quiet – a sudden contrast to the sunny optimism of a typical Santa Barbara day. Temperatures drop and stars emerge in an unparalleled density, leaving the sky lacy with glittering light. Now is the time to open your bottle of California sunshine, light a fire, and savour the taste of defiance. And the word is out. Ethan Lindquist, national sales director for Qupé Winery and the winemaker/owner of Ethan Wines notes: ‘This region isn’t a secret anymore.’ Indeed, tourists from home and abroad flock here on weekends, which makes weekdays the ideal time to plan your cellar door visits. As for the right time of year to visit? Rain is rare and the weather is welcoming year- round, but spring and autumn are best for the beauty of the landscape and ideal temperatures.